This year marked the fifth anniversary of the collapse of English language school giant Nova, which filed for bankruptcy protection on Oct. 26, 2007. Under the guidance of Nagoya-based G.Communication, the cram school and restaurant operator that initially bailed out the company, Nova was able to do what many viewed as the impossible and restructure (see “Four years after ‘Nova shock,’ eikaiwa is down but not out,” Zeit Gist, Dec. 20, 2011). Defying the odds and a sluggish economy, Nova is still operating, though now under the control of Tokyo-based Jibun Mirai Associe Co. Ltd., and is openly celebrating the feat. To mark the milestone, Nova is currently running its “fifth year return anniversary” campaign, complete with branded gifts bearing the company’s pink rabbit mascot, known as Nova usagi, for customers who either visit a branch or sign up for lessons. While G.Communication was able to breathe life back into the Nova brand in 2007, some 2½ years later it would find itself stepping in to bail out another English language school chain. Peter (not his real name) came over from Canada to work at one of Geos’ branches in Tokyo, attracted by the “competitive” salary and 29.5-hour workweek. “I also liked the fact that I had the same set classes every week, so I didn’t have to worry about my schedule changing around too much,” he says. Dwayne (also a pseudonym) left England hoping to live and work in Asia rather than just travel, and he felt at the time that Geos would allow him to do that. “Geos seemed to offer the best system for teaching, as well as the most solid support for teachers amongst the jobs I researched in Japan and China,” he explains. In addition to having his own classroom, Dwayne enjoyed the freedom to design and teach his own classes. While the experience at Geos may have been good on the surface, behind the scenes the company was experiencing financial trouble that was beginning to threaten its future. The dire situation of Nova in 2007 was marked by several delayed wage payments to instructors, as well as memorable faxes to branches that featured spiritual metaphors and optimistic rhetoric from the company’s president, but Peter says no such signs cropped up at the Geos branch where he worked. Dwayne, though, had heard murmurs about attempts by Geos to sell the business up to two years before it encountered financial hardship. So when Peter and Dwayne went in for work on April 21, 2010, they had no inkling of what was in store. As instructed, Peter arrived at the venue to be greeted by a large group of fellow Geos instructors and staff. “The company had gathered all of us together in the one place to tell us that Geos had gone bankrupt,” he says. Dwayne was called into his branch early to attend a short Internet conference where he and the rest of the staff were told to clear out the school, leave before any students arrived and attend the meeting in Nihonbashi to deal with the bankruptcy. While Dwayne was dismayed at the news, he realized that some of the signs had been there all along. After several speeches at the meeting by members of middle management, instructors were asked on the spot to indicate whether or not they wanted to re-sign with Geos under new postbankruptcy conditions. While Peter chose to take his chances under the new regime, Dwayne decided to opt out because he felt there was not enough information to make an informed choice. What’s more, he was unsure whether the declaration of intent he was being asked to make carried any legal weight. “What I did know was if I re-signed, it would have been as a ‘new’ employee without any of the accrued vacation, salary and retirement bonuses I had been entitled to as an employee of over six years,” Dwayne explains. Since he did not re-sign, Dwayne says he would have appreciated if G.Communication had provided more information about the unemployment benefits available to him and the other staff. After Geos filed for bankruptcy, G.Communication swooped in to pick up the pieces. As it had done with its acquisition of Nova, G.Communication would go on to permanently close a large number of Geos branches — almost 100 in this case — before resuming operations at the remaining 230. Peter’s school was one of the lucky ones to be spared the ax, and he soon found himself back at work with the same instructors and students. However, as part of the restructuring, G.Communication went about cutting costs in a process that hit instructors such as Peter in the pocket from the outset. G.Communication’s acquisition of Nova following its bankruptcy in 2007 was criticized by some observers for being clumsy and drawn-out, with numerous instructors sitting on standby for months until their branches were reopened. The cram school operator seemed to have learned from this experience, as the Geos restructuring moved at a quicker pace, with Inayoshi Capital, a separate company set up by G.Communication owner and founder Masaki Inayoshi, taking over the English language chain from Oct. 1, 2010. Despite the speedier restructuring process, Peter says the end result was not that much different from the one he had seen befall Nova. 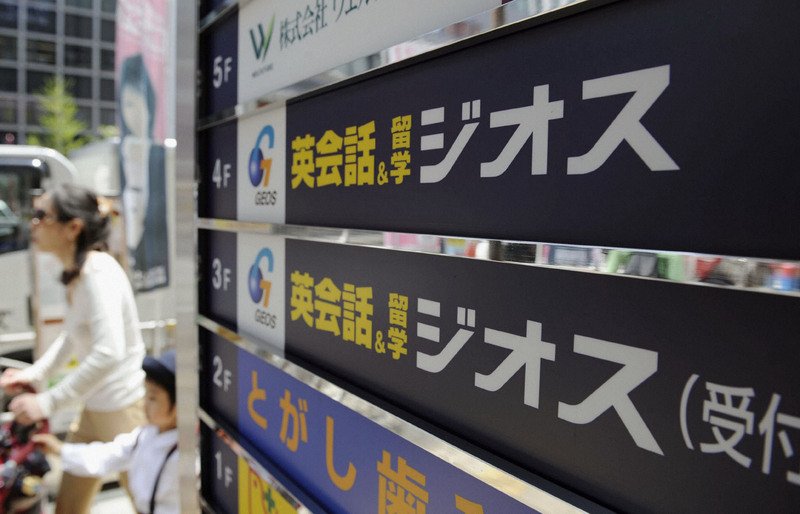 When the current operator of Geos, Jibun Mirai Associe, was asked to address the accusation that staff were treated badly in the race to restructure, a spokesperson said that was not the case, without elaborating. Despite developments such as these taking place in the background, Peter says that Geos students would have noticed virtually no change in their classes, other than perhaps different contracts and lesson rates, as the curriculum at his branch post-acquisition remained the same. Two weeks after taking over, Inayoshi Capital closed more Geos branches, many of them located near Nova schools, and began merging others with cram schools. Making use of its Nova acquisition, Inayoshi Capital rebranded certain Geos branches as “Nova x Geos,” with the Nova curriculum replacing the Geos one at the renamed schools. While there were likely a host of factors that forced Geos into bankruptcy, there has been much discussion among pundits about what role, if any, the earlier demise of Nova may have had on the financial health of Geos, not to mention the wider English language school industry. Matthew (not his real name), a Canadian instructor who worked at Geos a decade before the bankruptcy, also links the collapses of the two eikaiwa chains, but blames bad business practices in both cases. To illustrate his point, Matthew tells the story of his former branch, a small school that struggled to get students. Not only did the school face formidable competition from the nearby Nova, ECC and Aeon branches, he says, but another Geos school had also opened just a few stations away. The other factor that may have influenced Geos’ fate was a change made to Japanese consumer law at the turn of the millennium introducing an eight-day cooling-off period during which customers could back out of any consumer contract without incurring penalties. “I remember the president making a speech about that at a company meeting in which he complained quite a bit about the possible effects of the new rule,” he added. Having weathered a bankruptcy and the resulting branch closures, Peter eventually handed in his resignation at Geos at the end of 2011. 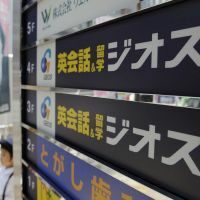 The Jibun Mirai Associe spokesperson disputed Peter’s claim that a flat salary is the standard payment system for English language school teachers. Before it was brought in across the board, “Geos already had the hourly wage system in place to meet the company’s various workforce needs, and as the number of candidates on working holiday and student visa who want to work part-time increased,” the spokesperson said. Two-and-a-half years on, Geos remains in operation following its restructuring, making some wonder if the “Nova miracle” has worked its magic a second time. Asked how Geos has managed to stay competitive in the crowded English education market despite the lingering sluggish economy, the Jibun Mirai Associe spokesperson stressed that casting a net both far and wide has been crucial. “Since Geos specializes in providing English lessons for children, Jibun Mirai Associe as a company has broadened its scope to provide services for a wider audience, ranging from children to adults,” the spokesperson said. Matthew, however, attributes Geos’ rebound to the simple fact that the company’s core business — offering English lessons at convenient locations — is still viable, provided it is done the right way. “Once they had trimmed the fat that had accumulated over the years, it seems they were able to make the remaining schools work,” he says. Send comments on these issues and story ideas to community@japantimes.co.jp.